Italian and Korean government representatives, companies, economic associations and economists will meet at the Lotte Hotel in Seoul, on April 18, 2007, to explore and discuss new, innovative business opportunities between the two countries. The event is sponsored by the Federation of Korean Industries, the Italian Ministry for International Trade and the Italian Institute of International Trade (ICE). The opening ceremony will be presided over by representatives of the two Governments at the highest level: Prime Minister of Italy H.E. Romano Prodi, the prime minister of Korea, Hon. Han Duck-soo, the chairman of the Federation of Korean Industries, Dr. S.R. Cho and the Italian minister for international trade and European affairs, H.E. 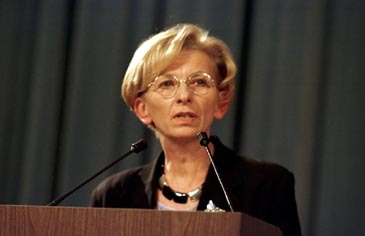 Emma Bonino. They all deliver insightful keynote speeches through which new, forward-looking ways of fostering economic exchanges between the two countries will be outlined. On this occasion three important Memorandums of Understanding will be signed: the first one between the Italian Institute of Foreign Trade (ICE) and the Korean Importers Association (KOIMA), followed by a second and a third Memorandum between the Chambers of Commerce of the Piedmont Region and of Milan and the Korean Small Business Corporation. After the opening session, the forum will continue with presentations aimed at underlining comparative advantages, strengths and opportunities in specific industries: design, textile and fashion, renewable energy and investments. The moderators of the forum are Mr. Rhee Jang-han, of the Federation of Korean Industries and Ambassador Umberto Vattani, the president of the Italian Institute of International Trade. The forum continues with a luncheon attended by dozens of Italian and Korean businessmen and presided by the minister of Commerce, Industry and Energy, H.E. Kim Young-ju and the Italian minister for International Trade and European Affairs, H.E. Emma Bonino. Companies and businessmen will then meet in the afternoon in a fruitful session of business-to-business meetings organized by the Korea Importers Association and the Italian Institute of International Trade. At the margin of the forum, finally, Minister Bonino - a personality extremely active in Italy in the promotion of gender equality – will meet a delegation of Korean businesswomen to discuss the role and importance of women in today's economic life. The business forum, organized on the occasion of the visit to Korea of the Italian prime minister, Romano Prodi and of the minister for international trade, Emma Bonino, mark a milestone in prompting current bilateral economic relations to new heights and performances and in searching for innovative ways to promote investments and joint-ventures among Italian and Korean companies.